Mark got his start in triathlon in 1995, after watching his father Terry compete at the Bluewater Triathlon in Bright's Grove. 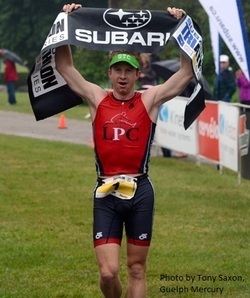 Mark spent the next few years competing in various Ironkids triathlon events, as well as the Bluewater Triathlon, and Goderich Triathlon. His father Terry, sister Kate, brother Joe and uncle Bernie are all avid triathletes, while mother Susan keeps the peace and ensures the family competition doesn't get too heated. As a Triathlon Coach with Loaring Personal Coaching, Mark has guided athletes to first-time finishes and personal records in triathlon distances from Try-a-Tri to Ironman, and run distances from 5k to the marathon. M.Sc. Exercise Nutrition & Metabolism, University of Guelph. Thesis: "Maintaining hydration with a carbohydrate-electrolyte solution improves performance, thermoregulation and fatigue during an ice hockey scrimmage". Presenter at American College of Sports Medicine (ACSM) 2010 Annual Meeting: "Sweat loss, fluid intake and sodium balance in triathletes during a 1h cycling test". Presenter at ACSM 2012 Annual Meeting: "Preventing mild dehydration with a carhohydrate-electrolyte solution improves ice hockey performance". Presenter at CSEP 2010 Annual Meeting: "Effects of mild dehydration on physiological, mental and performance parameters during ice hockey". Finalist in iRun Magazine Blog Idol 2.0 - Exercise hydration & Fueling focus. See articles here and here.